Trip report for Oct. 13, 2013. with record of a new Southern California species! As is sometimes the case with pelagic trips, things change! This morning 50 passengers and 7 leaders boarded the very nice Sea Adventure 80. She is owned and captained by Scott McDaniels, father of James McDaniels, our normal skipper, and owner of the Grande. Scott and the Sea Adventure 80 do a great job on whale watching trips in the winter months. I recommend them highly. Today's weather was also different in that we experienced overcast skies during the morning and a southwest breeze, affectionately known locally as a Catalina Eddy. Last weekend we'd had a Santa Ana condition with clear skies and a east wind. Each condition has its benefits and detractions. Fortunately both conditions were mild, and the ocean was most pleasant. Offshore we also found the bird life to have changed slightly. Although Black-vented Shearwater, Red-necked Phalarope, and Cassin's Auklets were abundant near shore as was the case last weekend, there were no big feeding concentrations this morning, to gather interesting species. Proceeding west to the middle of the Nine Mile Bank, we added Northern Fulmar and Sooty Shearwater, numbers of Parasitic and Pomarine Jaegers. Fulmar, and Sooty numbers were both up, Pom numbers were down today. Pink-footed Shearwater became the dominant shearwater by the outer edge of the "Nine". The early-morning numbers not impressive. We drove northwest along the bank for a decent look at a South Polar Skua. We got looks at a second S.P.Skua near the 30 Mile Bank. These southern hemisphere birds are rare but somewhat regular spring and fall migrants. For whatever reason they've been tough to get this year. Crossing the San Diego Trough was, as billed, dull. We didn't even have the benefit of the usual Common Dolphin pods to break up the monotony. The water over this featureless deep plain can sometimes pleasantly surprise us. Not today. Approaching the 30 Mile Bank, we expected to start seeing a little more life. That really did happen, and that had the leaders worried. A Red-billed Tropicbird saved us momentarily, with a nice show ahead of the boat. Then as it tried to escape the attentions of a jaeger, it flew right over the length of the boat. Red-b. Tropicbird is usually highly pelagic and is rare but regular well offshore late summer and fall here. The 30 Mile Bank and San Diego Trough are usually the northeastern edge of their expected range. We've had a very good summer for them locally, only missing them on one trip offshore since Aug. 1st. We also found a first of season Bonaparte's Gull here on the 30 Mile. This unfortunate bird also being chased by a jaeger. The storm-petrels rafts eluded us today, but a decent consolation was a moderate-sized feeding group of Black and Least Storm-Petrels around a piece of fat or bubbler. We got some nice comparison looks at those quite different species. Least Storm-Petrel is another San Diego specialty. A central Baja breeder it was once considered an irregular visitor here. 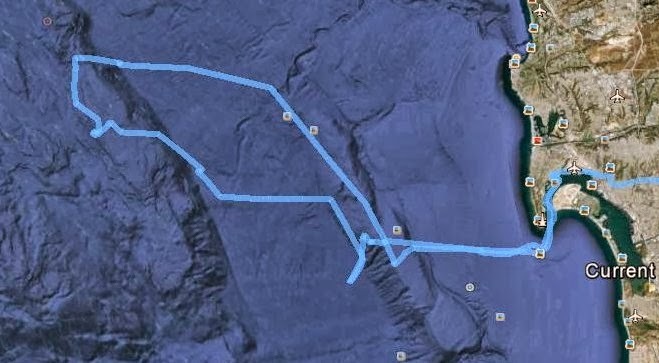 The discovery of these massive storm-petrel rafts (daytime roost) centered between San Clemente Is. and the San Diego coast may prove them more regular here than we once expected. This year for instance, no Least, and very few Blacks Storm-Petrels were seen far from this area. Had we only birded the Nine Mile Bank, the southern portion of the 30 Mile Bank, or La Jolla this year, we would have deemed Least Storm-Petrel absent. This piece of fat/bubbler also had a group of a dozen or so Northern Fulmars of several color morphs. The trip down the 30 Mile Bank and out into the S.D. Trough was quiet with no hint of a murrelet of any type. A disappointment, but not completely unexpected. Half way across the San Diego Trough we got a mid afternoon wakeup call with a flyby Black-footed Albatross. Certainly not a rare bird well offshore, but never a regular in these waters, and much less so in fall than in spring. Our return to the Nine Mile Bank was greeted by a mass of feeding Common Dolphin, and swirl of Pink-footed Shearwaters. We moved around the melee to find several N. Fulmar, Sooty, and Black-vented Shearwaters, and then a Flesh-footed Shearwater. As with last week's Flesh-foot, some chase was required and sorting through other dark-bellied species, but we got this rare visitor from the New Zealand area in everyone's view. Interestingly this was in the exact same area as last week's Flesh-foot. Same bird? I think that's a good possibility, lots of food here, and many Common Dolphin to push the food up to the surface. Why leave! To this point in the trip we'd done pretty well. We'd gotten the hoped-for San Diego specialties Least Storm-Petrels, Red-billed Tropicbird. We had nice looks at a rare for us Flesh-footed Shearwater. Black-footed Albatross, and South Polar Skua were certainly nice birds for our list. Those and a good mix of expected species. We were all feeling pretty good. Sure we'd had a few misses, almost every trip does. Then in the category of saving the best for last, as we moved away from the feeding mass I along with all the passengers heard from the P.A. "WHAT THE…….WHAT…..IS…THAT.. A ….A…… GREAT SHEARWATER !!!!" This bird was sitting on the water with a couple of Pink-foots, got up and came right over to the boat and landed. Took off again circled and landed in the gull flock 25 ft. from the stern! Tons of photos! Lots of ooohs and aaahhs! Now I know you east coasters will be unimpressed, and there were a few on the boat. Imagine a Pink-footed Shearwater being seen off Hatteras.. now you're getting closer. Although Great Shearwater is VERY rare, seen a few times off the West Coast. This is we believe to be the first Great Shearwater seen off Southern California, and certainly the first off San Diego. What a moment of pure joy! One of those fun moments that comes with birding, made extra special with the great unknowns of the oceans. The rest of our trip back to the harbor was uneventful in comparison. Though we passed through group after group of Black-vented Shearwaters, Red-necked Phalaropes, and even had a few of well seen Cassin's Auklets. I think many cell phones were working overtime in San Diego Bay. I saw one i-phone being used to take a picture of a SLR viewing screen. I hope I don't cause anyone problems by telling the story of a onboard birder calling his wife to report seeing a Great Shearwater. I gather the response was.. "That's nice honey…what kind was it?" visions of Abbott & and Costello’s “Who's on first" there. So forgive my ………What kind of trip was it? …A GREAT trip!